The former Gasification Technologies Conference has expanded its footprint to cover all forms of syngas generation and its name has followed this logic to become the Gasification and Syngas Technologies Conference (GSTC). Thus the 200 or so attendees were able to hear presentations on steam–methane reforming and autothermal reforming as well as the traditional gasification technologies. Following market trends, there was more emphasis on syngas to chemicals and fuels and less on syngas to power than at previous conferences of the series. Amongst the papers on power the most interesting one was on the Kemper IGCC project. In June 2017 it had been announced that for economic reasons the plant would continue to operate on natural gas and that the syngas generation facilities would be mothballed. With a current natural gas price of about US$3/MMBTU and the EIA forecasting this level until the end of 2019 at least, this was perhaps not surprising. But nonetheless it was not a good signal for IGCC. The presentation by Southern Company discussed some of the technical difficulties overcome and the principal remaining challenges. The plant has achieved 224 days of lignite gasification and the gasifiers have operated at 100% load. All the environmental requirements have been met including the 65% carbon dioxide capture and transport for enhanced oil recovery (EOR). The Siemens gas turbines were still going through their planned verification programme with syngas firing at the time that the gasifiers were stopped. 73% syngas firing load had already been performed successfully. The machines had shown excellent operational flexibility while maintaining combustion stability while running on 100% natural gas, 100% syngas and co-firing. Start-ups and fuel transitions were smooth. Fuel following with fixed load, load following with fuel supply and fuel pressure following modes of operation had also been successfully tested. There had been press reports about difficulties with the refractory lining of the gasifier. It had been decided to install this under shop conditions before transporting the gasifier to site anticipating that this would ensure a high quality product. This turned out not to be true and the gasifiers had to be re-lined on site before they could be used reliably. A major problem had been specification of the coal, which often contained more moisture and more fines than originally specified. The problems manifested themselves in the fluid-bed driers rather than the gasifiers themselves. The higher moisture content required the driers to be operated in an overload condition, but the increased loss of fines from the fluid bed overloaded the downstream equipment. The stopgap solution was to run the plant with the spare drier operating so as to reduce the overload on the individual driers. Modifications were made in May and June 2017 that enabled 80% load to be achieved with only two of the three driers in operation. Among the “next steps” identified was to “evaluate alternative uses and potential partners for Kemper gasification, syngas clean-up and carbon capture assets.” This could be interpreted as possibly re-dedicating the syngas production to chemicals or synthetic fuels. Who knows? But Kemper was not the only power application presented. In particular an update on the progress on the NET Power Allam cycle project using supercritical CO2 as working fluid was interesting. Already parts of the 50 MW natural gas-fired plant in La Porte, Texas, are being commissioned, so we can expect operation some time in 2018. The presentation was made by the Energy & Environmental Research Center of the University of North Dakota, where studies are being performed to adapt the facility to a coal gasification front end. Underground coal gasification does not receive the attention today that it did say five or ten years ago. But the 50 MW Theunissen power project in South Africa continues to progress. Currently it is awaiting final government decisions on the independent power producer (IPP) awards. During the conference a possible extension to include the production of synthetic fuels was presented. There continues to be considerable interest in the use of renewable fuels for all gasification applications. This includes waste-to-energy processes and projects. An interesting example was provided by two waste water treatment plants serving Santiago de Chile together producing over 10 MW gross or 7.5 MW net. The plants use the Spanish Greene rotating kiln technology. Commissioning of the first train at Mapocho is planned for May 2019. The second train and the Farfana plant will come on stream early 2020. A second waste-to-energy technology was presented at the exhibition stand of Aries Clean Energy, the former PHG Energy. This was their 0.3 MW plant at Lebanon, Tennessee that came on stream in 2016 and is claimed as the largest down-draft gasifier in the world. Chemicals attracted a lot of papers, with both methanol and hydrogen having dedicated sessions. Fluor presented an interesting concept in the methanol session showing an application for their Econamine technology, which is today better known as one of the commercially available options for CO2 removal from power plant stacks. In the methanol application it can remove CO2 from the stack of the reformer furnace and react this with surplus hydrogen from the methanol synthesis purge gas to make more methanol product. Of course the natural gas demand in the plant increases, since it is required to replace the hydrogen otherwise used as reformer fuel, but the methanol capacity can be increased by as much as 33%. A second methanol presentation, by Casale of Switzerland, included discussion of their autothermal reformer technology as employed in what is currently the world’s largest methanol plant, a 7000 t/d unit for Kaveh in Iran. While the methanol session focussed primarily on large plants, Linde presented its concepts for small ammonia plants. Instead of using a dedicated process specifically for ammonia, it connects two standardised and modularised plants – one for hydrogen and one for nitrogen – mixing the product gases inasuitableproportionforthesynthesis.By using standardised and modularised solutions that have been developed separately for other applications, Linde claims to overcome the disadvantage of scale that otherwise makes small plants uneconomic. A new chemical application for syngas is the manufacture of monoethylene glycol (MEG), known to the general public as anti- freeze (9% of world production), but mainly used as an intermediate in the production of polyester fibres (54%) and PET bottles (26%). The traditional route to MEG is via ethylene oxide, but there has been interest in a syngas route for many years. Chinese and Japanese companies have developed the oxalate route in which dimethyl oxalate is used as an intermediate. In the last two or three years the first commercial scale plants have come on stream in China, downstream of coal gasifiers. At the conference Eastman and JM Davy presented their new route from methanol, which is said to reduce energy consumption. Velocys reported on the successful start- up of their 250 bbl/d Oklahoma City plant, which is the first smaller scale commercial demonstration of its microchannel Fischer- Tropsch technology. The plant operates on a mixture of landfill gas and natural gas using steam reforming technology. Plant owner Envia is planning to submit an application for qualification under the US Renewable Fuel Standard. Velocys has changed its business strategy from being simply a supplier of technology owner to being an investor in plants based on its technology. The first US biorefinery project using woody biomass is now under development. The location is in Natchez, Mississippi. A second plant under development is a joint venture with British Airways and Suez in the UK. Alternative approaches to liquid fuels were provided by ExxonMobil with its Methanol-to-Gasoline (MTG) technology and Standard Alcohol, which has developed a mixed alcohol technology. This product is promoted as a gasoline additive with high octane rating and low Ried vapour pressure. A few years ago LNG prices in Asia were around US$ 15/MMBTU. This led to consideration and actual realisation of a number of plants to generate substitute natural gas (SNG) from coal and petroleum coke. The drop in price to the region of 7-10 US$/MMBTU has made such projects less attractive, but those already under construction have been taken to completion. One of these mega-projects originally motivated by the high LNG price is that of Reliance at their Jamnagar refinery in India. Frances Anthony provided an overview of the status of this project. Phase 1 includes four 2900 t/d petroleum coke gasifiers. Construction is 100% complete and commissioning is ongoing. Construction of Phase 2, with a further six similar gasifiers, is 85% complete. Start-up of this phase is also planned for 2018. The economics of this plant are different from those of simple SNG production, since the SNG displaces various refinery off-gases that can now realise their petrochemical potential, rather than being used simply for fuel value. Nonetheless consideration is now being given to additional chemical uses of the syngas to enhance the economics further. At the other end of the size scale Dahlman- ECN presented their 4 MW Ambigo bio- SNG project, to be located in Alkmaar, The Netherlands. The plant is to be operated on waste wood, with construction planned to begin in 2018. 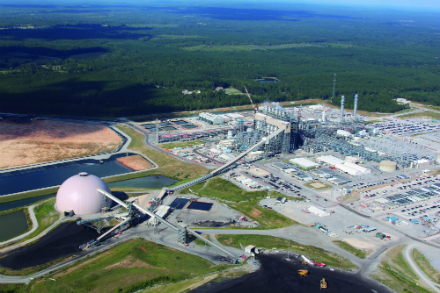 IHI gave a paper on their new TIGAR coal gasification process. This takes the same approach as the Güssing biomass gasification concept by using steam instead of oxygen as gasification agent, but IHI are the first to apply it to coal. The key to this process is that it is able to produce a low nitrogen syngas without the need for an oxygen plant, thus saving an expensive CAPEX item. In the fluid bed gasifier the gasification is not complete. The unconverted char is diverted together with the bed material to a separate fluid bed combustor where the unconverted char is burnt off and supplies the bed material with sufficient heat to maintain the gasification reaction when it is returned to the gasifier. IHI is currently operating a 50 t/d demo plant in Indonesia and the results certainly look encouraging. One of the most fascinating papers was presented by RTI (Research Triangle Institute). The Institute has now commercialised its warm gas desulphurisation process and turned its attention to other topics including micro-scale steam reforming technologies. The intention is to use standard internal combustion engines as a device for reforming natural gas. They have tested a commercial V8 motor to produce 50 000 scfd (60 Nm3/h) syngas using a standard generator set as a brake. The syngas exhaust from the engine has been coupled to a methanol pilot skid which has performed successfully. Given the low cost of such commercial, mass-produced equipment, this is expected to produce considerable interest.